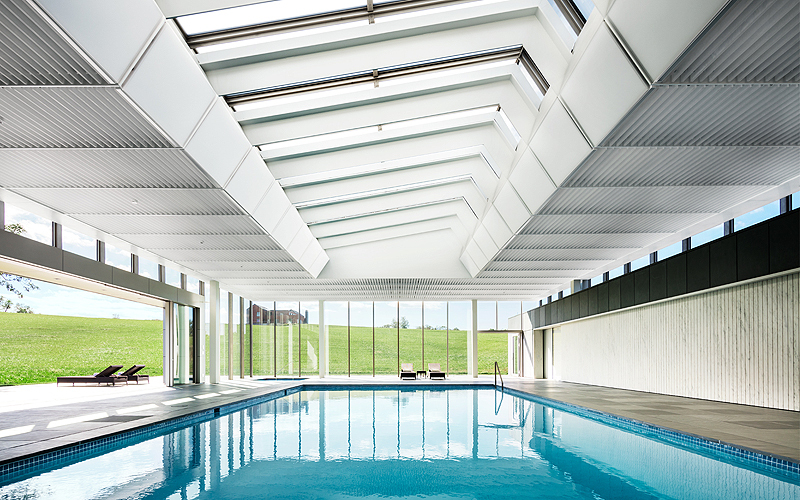 The new “wet” area, expanded to accom­mo­date a larger pool, is housed within a roof struc­ture made of custom fab­ri­cated steel T-beams span­ning 46 feet. 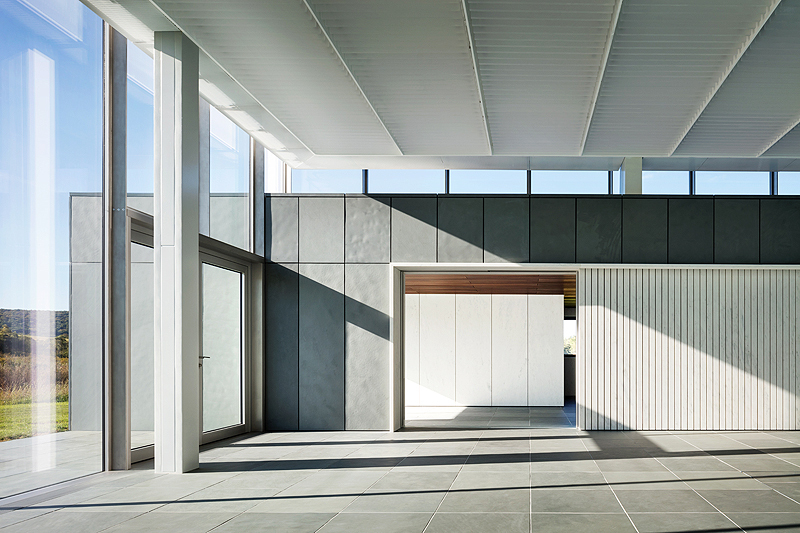 Each beam is uniquely shaped to meet the low roof slope while defining a uni­form ceiling plane. The sky­light beams are “kinked” up to create an unin­ter­rupted pro­file to the roof struc­ture. Acrylic panels spaced 4” on center between the beams give a lumi­nous feel to the ceiling while allowing moist air to move freely under the steel decking. By doing so, mois­ture can move freely to the roof steel decking elim­i­nating a ceiling cavity that can allow con­den­sa­tion problems. All the new mechan­ical sys­tems are located in a double height space in the low building that was for­merly the squash court. 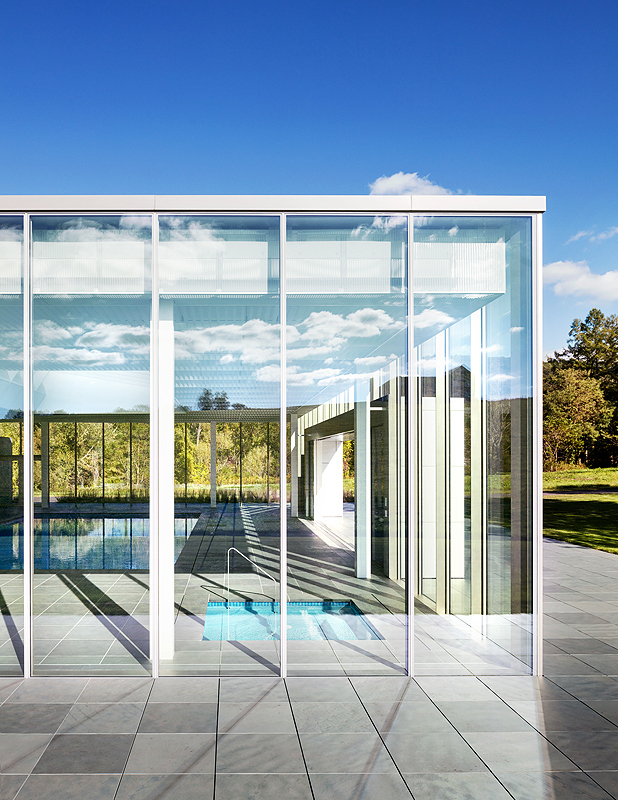 Pri­mary ducts buried under the pool deck feed a con­tin­uous floor grill fol­lowing the perimeter of the glass wall. Addi­tional heat is pro­vided by fin tube piping hidden in the upper fascia, behind the glass wall. There is also radiant floor heating throughout the. 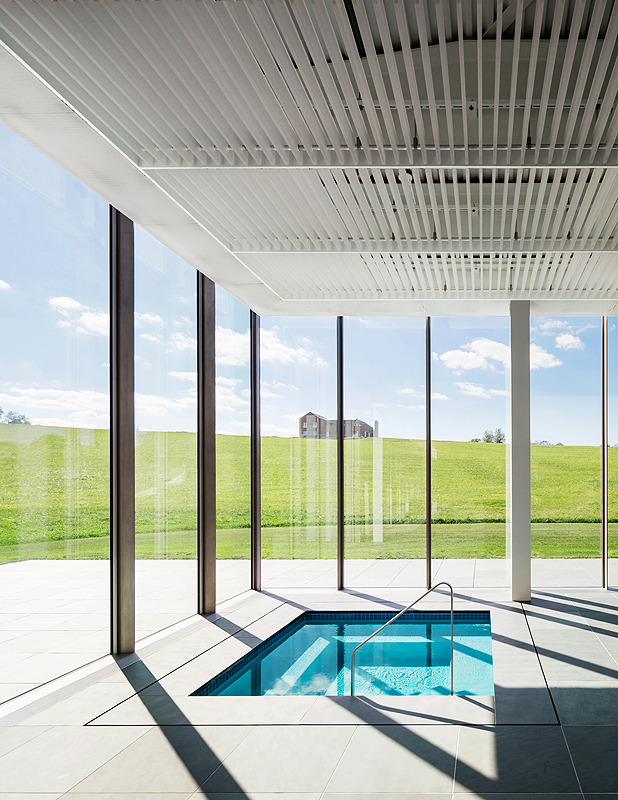 In unison, these heating net­works will main­tain the pool at a con­stant 55% rel­a­tive humidity and 85 degrees. 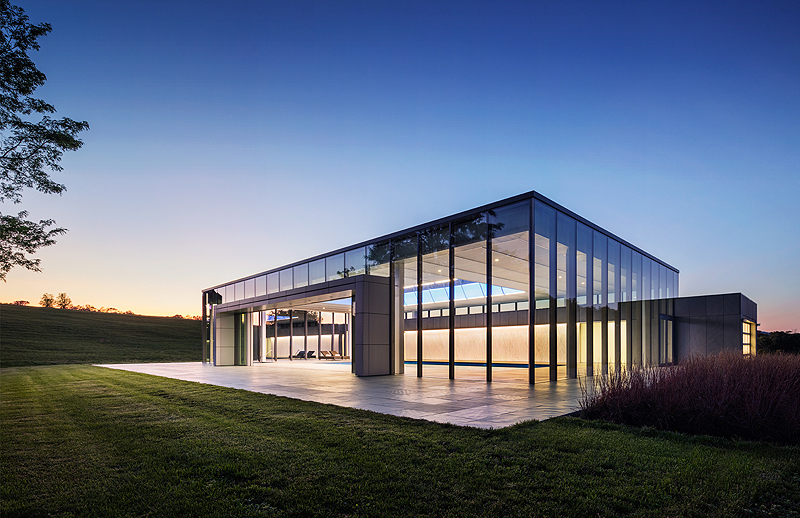 Exhaus­tive Dynamic Thermal Mod­eling sim­u­la­tions were run to estab­lish zero to min­imal con­den­sa­tion on key enve­lope ele­ments such as the sky­lights and cur­tain wall mullions. 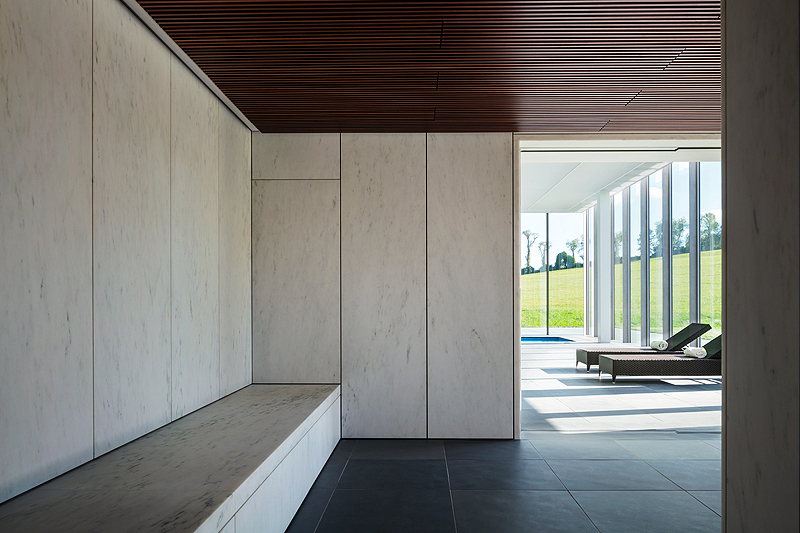 As part of the design approach to expose cav­i­ties to mois­ture vapors, the stone wall facing the pool is con­structed with open joints allowing air to pass freely to the vapor bar­rier. The ver­tical, white marble slats within this wall artic­u­late this engi­neering approach while cre­ating a softly lighted design feature. 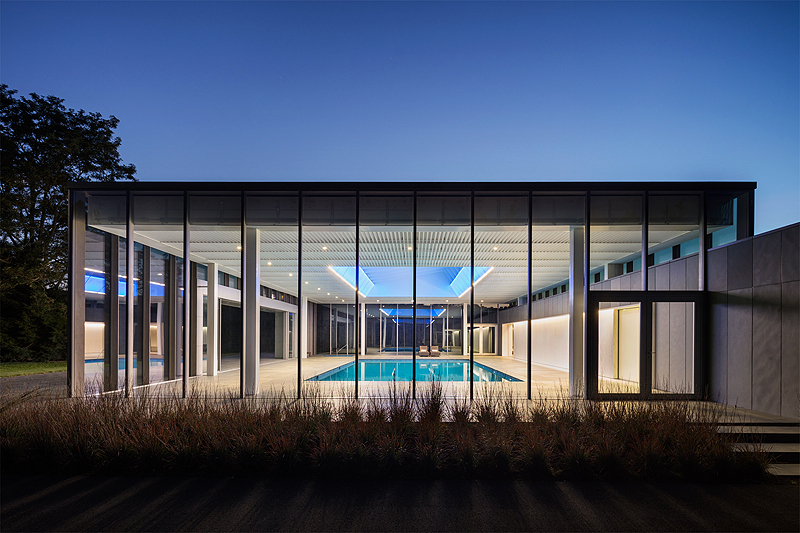 The low building has been reclad with slate panels that match the pool deck and ter­race. 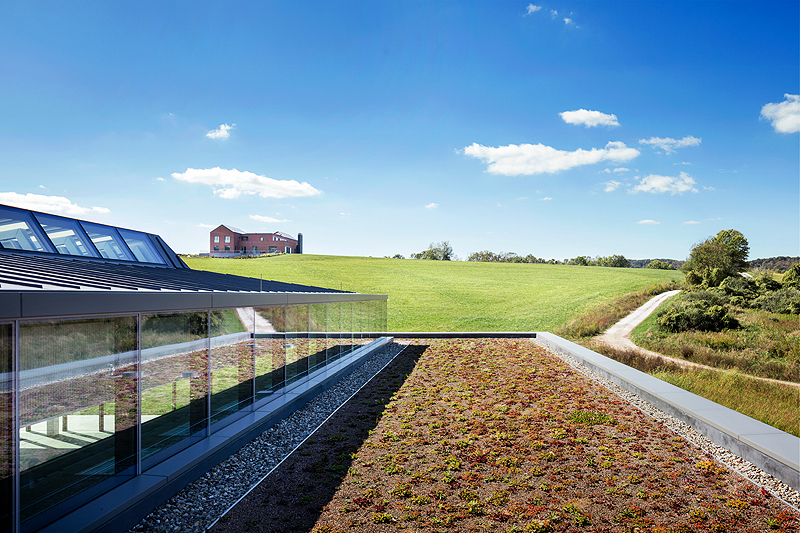 A new green roof pro­vides storm water reten­tion while also cre­ating a land­scaped ele­ment vis­ible from the main house.